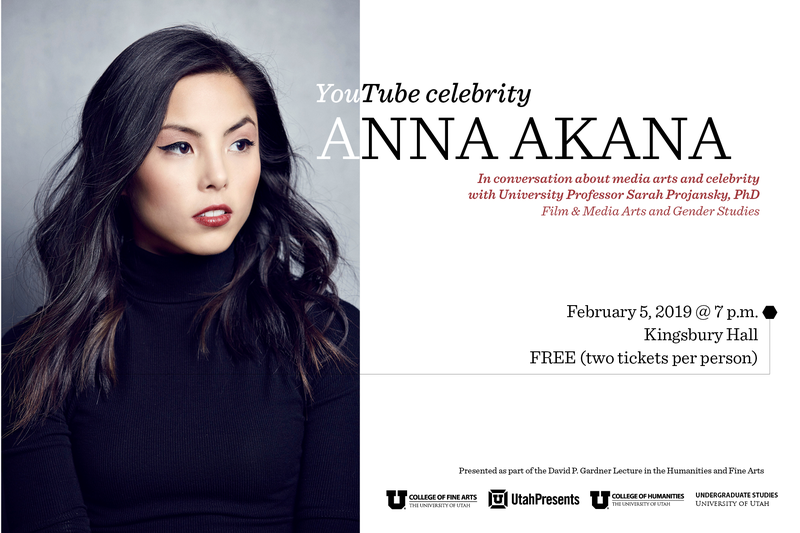 As part of the University of Utah’s David P. Gardner Lecture Series in the Humanities and the Arts, the College of Fine Arts is thrilled to partner with UtahPresents and the Office of Undergraduate Studies to welcome actress, producer, filmmaker, writer and YouTube celebrity Anna Akana to campus on Tuesday, Feb. 5, 2019, at 7 p.m. at Kingsbury Hall. Akana started her YouTube channel in 2011, jumpstarting her career as an actress, producer, filmmaker, and writer. In 2013, she wrote and starred in the digital series “Riley Rewind,” which garnered over 25 million views across YouTube, Facebook and Netflix. Now, with nearly 2.5 million subscribers, Akana produces short films, sketches and series for her channel in addition to her weekly YouTube show, which features semi-autobiographical comedic stories that offer life advice. This year’s lecture is designed as a conversation between Akana and University of Utah professor Sarah Projansky, who holds a joint appointment as a professor in the Department of Film & Media Arts and in the Gender Studies Program and is also an adjunct professor in the Department of Communication. Projansky is leading a campus-wide project on the role of celebrity in contemporary social, cultural and political life, including a general education class, a visiting speaker series and a symposium. Akana, as the 2019 David P. Gardner lecturer, comes in a long line of diverse, brilliant and talented individuals that includes Stanley Nelson, Suzan Lori-Parks, Tony Kushner, Anna Deavere Smith and Mira Nair. Tickets are free, but required. Limit two per person. Get tickets now. The University of Utah Ballet Program proudly presents “La Fille Mal Gardée,” a full-length comedic ballet gracing the Marriott Center for Dance stage Feb. 7-16. Based on a 1789 French ballet, the School of Dance presents a new interpretation by Bruce Marks, with staging by Mercyhurst University professors Tauna Hunter and Michael Gleason. This dynamic adaptation breathes new life into the classic story. “La Fille Mal Gardée,” or the “Poorly Guarded Girl,” transports audiences to an idyllic pastoral countryside where a love triangle creates comic chaos. In this romantic comedy, Lise, the only daughter of the overbearing Mother Simone, attempts to free herself from a marriage with her uninterested fiancé, in order to be with her true love Colas. The engaging and lighthearted storyline is propelled by the mischievous antics of the cast as they hilariously navigate the ballet’s three acts. This upbeat production features a lively succession of scenes of gossiping villagers, maypoles and hay wagons, all paired with Marks’ intricate and challenging choreography. Marks received his performing arts training at the New York High School of Performing Arts, Brandeis University and The Juilliard School. In 1956, he joined the corps de ballet of the Metropolitan Opera Ballet and in 1958 became premier danseur. Marks joined American Ballet Theatre in 1961, soon being promoted to principal dancer. In 1971, he became the first American principal dancer with the Royal Danish Ballet where he remained for five years. By 1976, Marks became co-artistic director of Ballet West at the invitation of its founder Willam Christensen, and in 1978 became the prestigious company’s artistic director. In 1985 Marks assumed the position of artistic director of Boston Ballet, a position he held until 1997. A founding member of Dance/USA, Marks was chosen in 1989 to replace the late Robert Joffrey as chairman of the International Jury of the USA International Ballet Competition, a position he still holds. He has created of 30 original ballets over the course of his career. He has coached and staged ballets for companies like the American Ballet Theatre, Royal Danish Ballet, National Ballet of Canada and many others. Tickets are available online, by phone at 801-581-7100 or at the door 30 minutes prior to curtain. For more information please visit dance.utah.edu.